California’s wonderful year-round weather is as good for the wine we produce as it is for those who live and visit here. 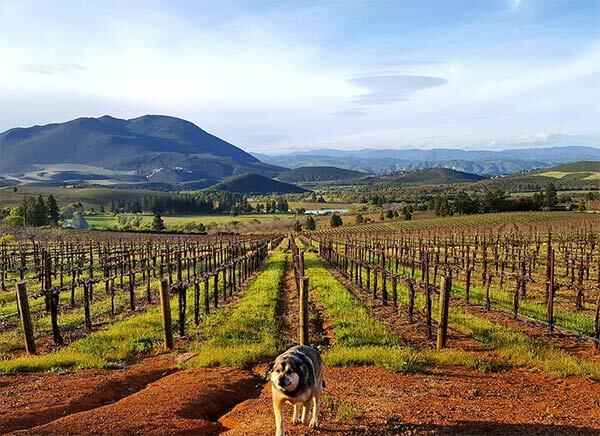 Abundant sunshine assures a long grape-growing season and world-class wines and over 600 vineyards that DogTrekkers and their four-legged companions find irresistible. For detailed information about the area you're interested in visiting this fall, click your destination on the map below. Southern California's high-desert wine country is centered around the town of Temecula, 90 miles southeast of Los Angeles and 60 miles north of San Diego. A mild climate prevails year-round, with ocean breezes sweeping away much of the pollution that plagues the region's metropolitan areas. Dog-friendly lodging, shops, restaurants and wineries abound in this very casual, outdoorsy community. People are often surprised to hear that San Diego was the first area in California where vineyards were planted and wine produced.San Diego County's legacy of viticulture and viniculture reaches back into the 18th and 19th centuries when the Franciscans tilled the San Diego Mission lands. A rustic destination, Suisun Valley Wine Country is a fun place for visitors who are searching for world-class wines, home grown farm products, and a beautiful, agricultural landscape, without the crowds. Sonoma County is one of California's largest producers of wine grapes. The most common varieties are Chardonnay, Cabernet Sauvignon, and Pinot noir. Sonoma County's laid-back Russian River region is especially renowned for its dog-friendly atmosphere. Napa Valley is one of the premier wine regions in the world. The combination of Mediterranean climate, geography and geology of the region are perfect for wine grapes. 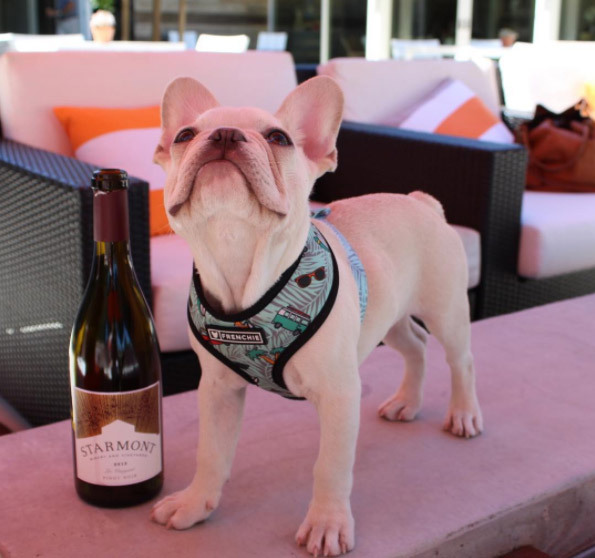 Over 100 of the valley's wineries are dog-friendly. Yolo County is the heart of California's tomato industry, but also boasts a crop of family-owned wineries, and is home to the U.C. Davis enology department. 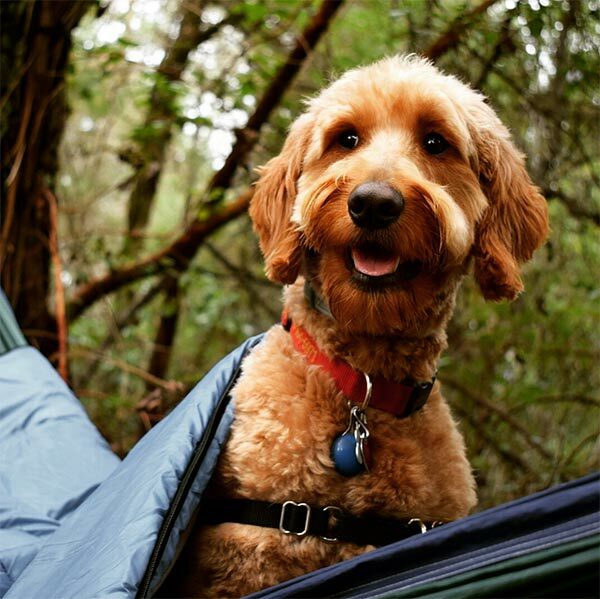 BLM and U.S. Forest Service trails offer great dog-friendly hiking. Livermore Valley, part of the Tri-Valley region, has a rich winemaking history. The Petite Sirah grape produces Livermore's best known red wine. 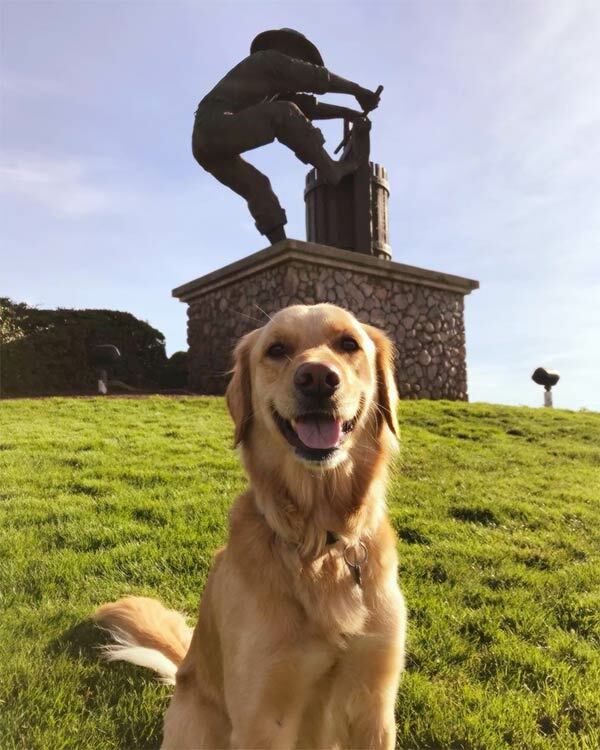 The Tri-Valley is a verdant dog-friendly destination with wide-open spaces, historic town centers and authentic cultural offerings. The Santa Cruz Mountains contain a number of microclimates, varied depending on the elevation of the land, the effects of fog, sun exposure, soil type, etc. 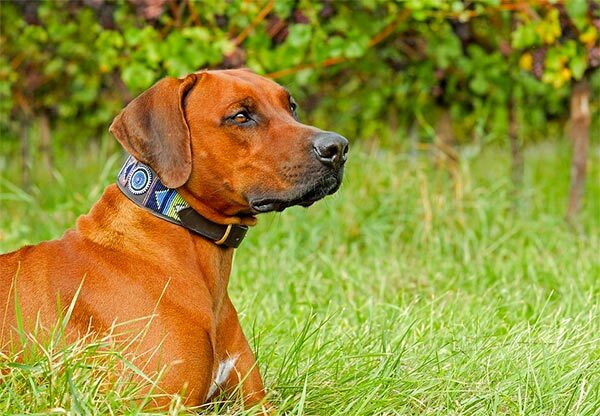 There are over 200 small vineyards in the Santa Cruz Mountains appellation, many of which are dog-friendly. San Luis Obispo County includes the popular Paso Robles AVA. Paso Robles is known for its heritage Zinfandel, Rhone-style wines, and blends and styles that are unique to the region. 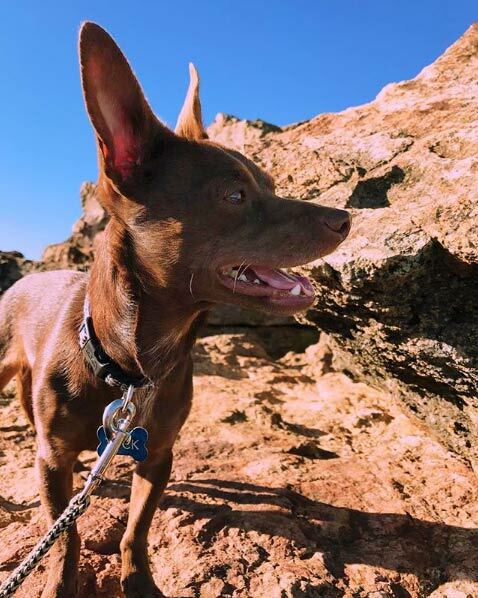 Beaches, mountains, and dog-friendly hospitality welcome you and your pup. San Joaquin County includes Lodi, home to grape growing since the 1850s. The soil in some parts of the region is similar to France's Chateauneuf du Pape. 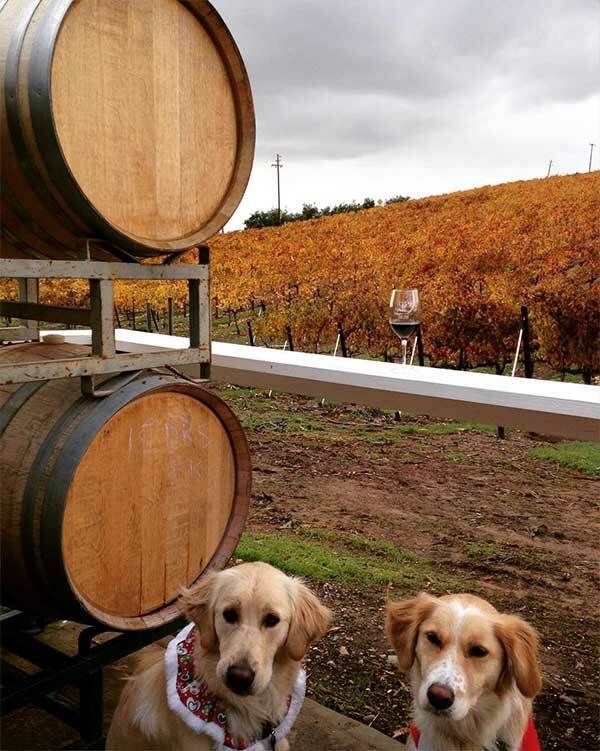 The region includes several dog-friendly and family-friendly wineries. Over half of the grapes grown in the Monterey area are chardonnay. In the northern area, riesling and pinot noir are popular, while in the south, Bordeaux varietals are most often grown. Monterey County includes Carmel, possibly the most dog-friendly city on the California coast. The first wine grapes in Santa Barbara County were planted by missionaries late in the 18th century. The 2004 film Sideways focused attention on the county as a wine growing region. The Douglas Family Preserve is a fun off-leash experience. Sacramento County extends from delta lands between the Sacramento and San Joaquin rivers, into the foothills of the Sierra Nevada. 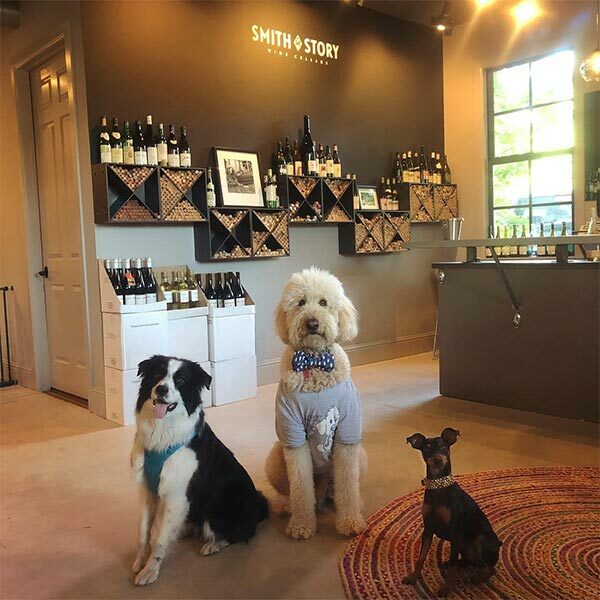 The city of Sacramento is home to dog-friendly urban wineries in the historic district. Nevada County in the Sierra Nevada specializes in specializes in hand-crafted mountain-grown wines and rich gold country history. 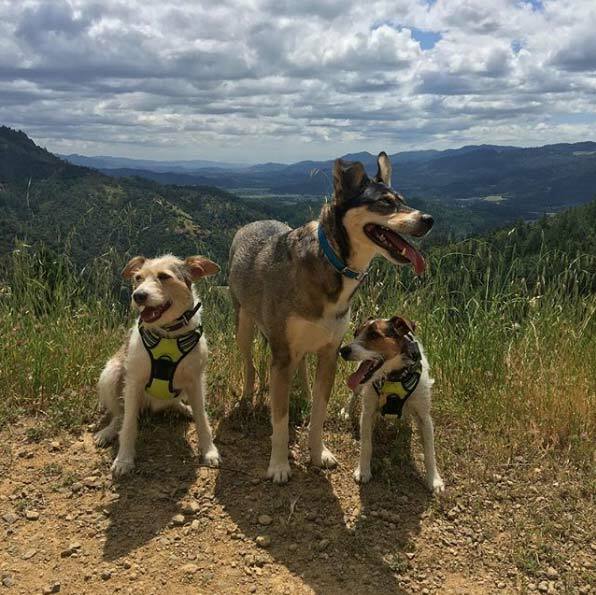 The historic towns of Grass Valley, Nevada City and Truckee offer a great home base for hiking and exploring with your dog. Placer County's winemaking roots date back to the gold rush, when French 49'er Claude Chana made his fortune growing fruit, including 200 grape vines. Hot summer days and cool nights are a boon to the county's winemakers. Multiple-use trails cater to hikers, dogs and horses. El Dorado County wineries produce Zinfandel, Cabernet Sauvignon, and Merlot and are beginning to plant the Rhône varietals. In addition to scenic hiking and biking, the area offers dog-friendly wine tasting, gold panning, dining and accommodations. Amador County in the Gold Country, renowned for Zinfandel, is home to more than 40 wineries, including the oldest Zinfandel vineyard in America. The area offers excellent dog-friendly hiking in the foothills. 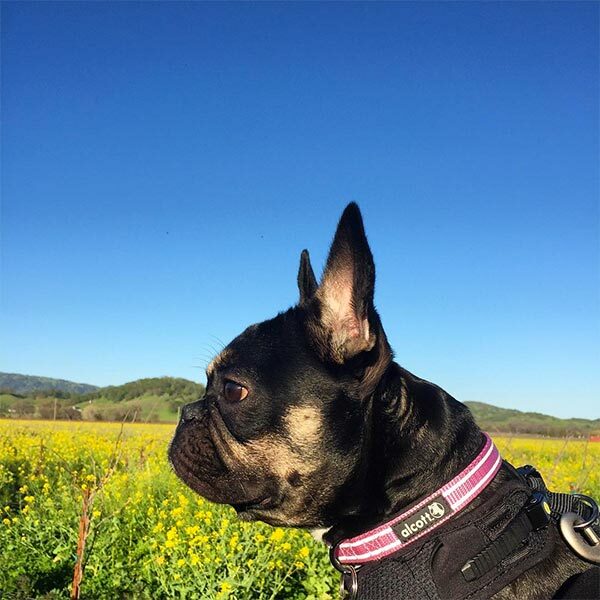 Calaveras County may be better known for frogs than wine, but this friendly uncrowded foothill region in the Gold Country has several dog-friendly wineries, as well as wide-open spaces, scenic hiking trails and water features where dogs can play and exercise. Wine lovers rejoice! 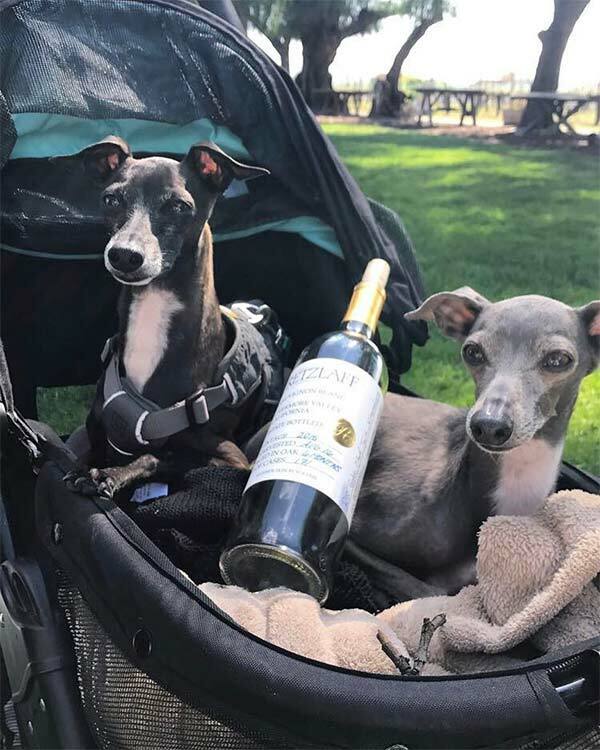 There are plenty of dog-friendly wineries, restaurants, bars and one-of-a-kind venues in Los Angeles that are sure to fulfill your inner-oenophile, whether you're looking for a tasting, a rare bottle or a truly unique touring experience. Monterey wines rely on warm sun, cool fog and nurturing soils resulting in intense varietal flavor. Chardonnay, pinot blanc and riesling are notable varietals grown near the coast, while reds are more common in the warmer southern areas. You can sample them all while your dog waits patiently (we hope!) 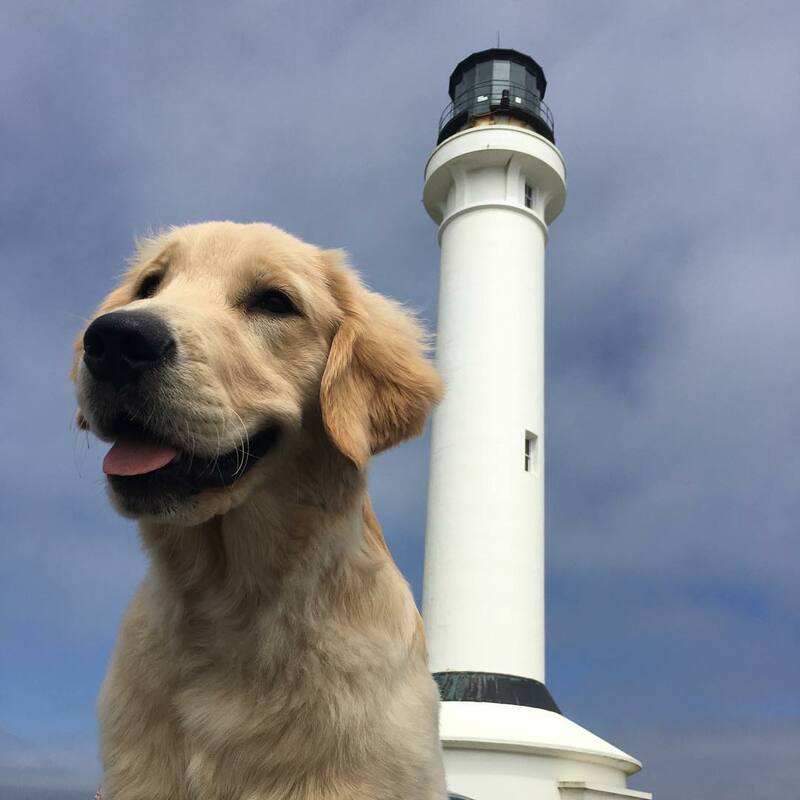 by your side at dozens of pet-friendly tasting rooms from Cannery Row to Carmel to the Santa Lucia Highlands. Best bet: Pick a region and check out our recommended itineraries. The San Joaquin-Sacramento River Delta (often referred to as the California Delta) is a maze of navigable waterways winding from Sacramento to the San Francisco Bay. You don’t need to go far out of town to get a taste of the farm towns, wineries and bucolic agricultural scenes alongside the Sacramento River. 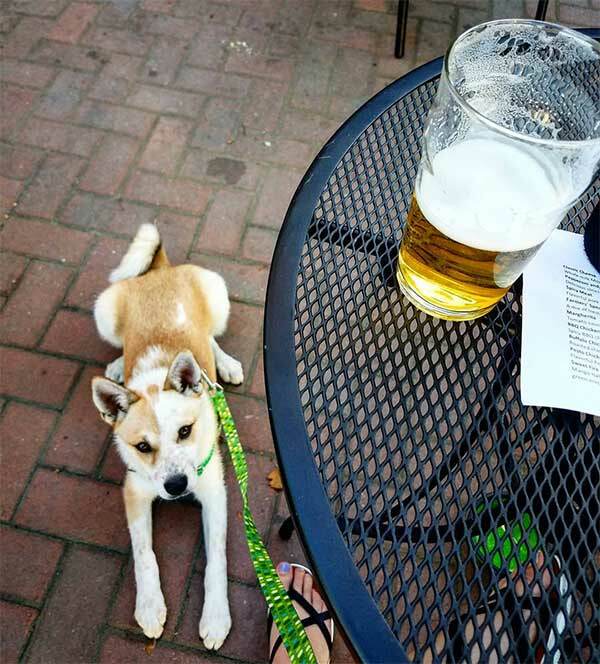 The dog-friendly places we recommend for a short outing are all within 15 miles of downtown Sac. 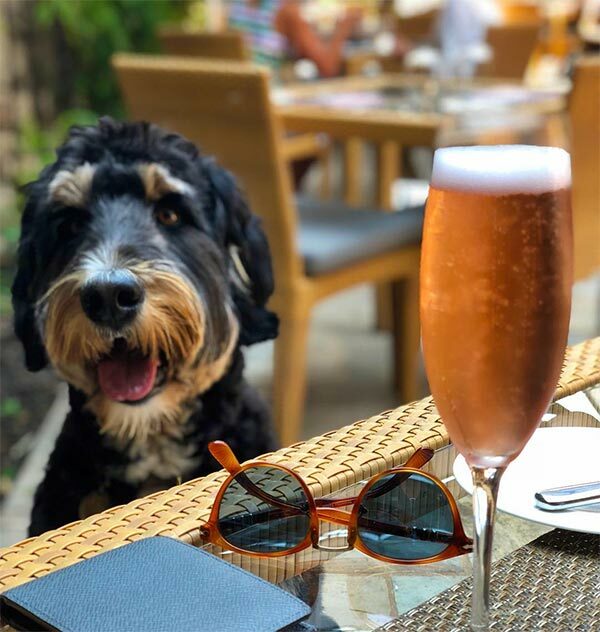 If you’re up for a special-occasion getaway centered on food and wine and can’t leave your four-legged other behind, consider the oh-so-chic Napa Valley town of Yountville. This culinary mecca is chock-a-block with strollable tasting rooms and restaurants (most with dog-friendly outdoor seating). Some 19 tasting rooms clustered within a mile of each other participate in the Yountville Wine Walk, which awards prizes based on the number of establishments visited. 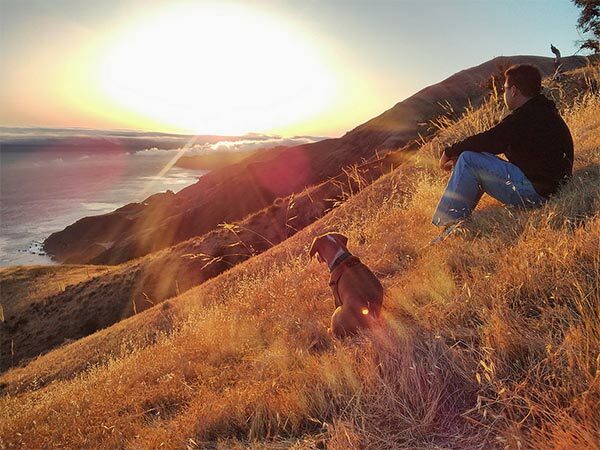 Are you one of those folks who enjoys taking selfies with your dog wherever you roam? Add some fun to your quest by participating in the Placer Wine Trail Photo Hunt, a contest taking place through December. The deal: Visit a member winery, find the “treasure” (it might be an artwork, an artifact or a physical feature of the property), take a selfie, post it on Instagram and be entered to win a $100 gift card. “Agritourism”—an agriculturally based operation or activity that brings visitors to a farm or ranch—is as old as winemaking in California, yet there aren’t many places where visitors with dogs can spend the night on the premises. Bed & Barrel at Stonehouse Cellars, a winery/tasting room/B&B in Clearlake Oaks, Lake County, is an exception. 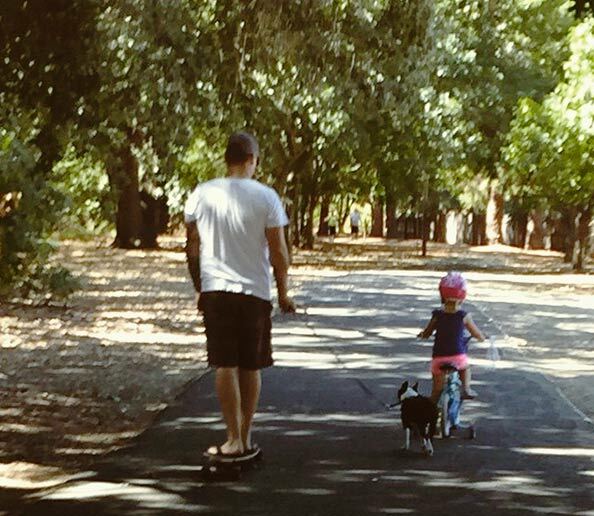 Yes it’s primarily a bike path, but dog walkers will find much to enjoy along the shaded, 4.4-mile Alamo Creek Bikeway, which meanders through southern Vacaville and connects several municipal parks, including Nelson, Patwin and Beelard. Want to keep going? The trail intersects the Southside Bikeway connecting downtown Vacaville to the north and Al Patch Park (sports fields and restrooms!) to the south. Taken aback by prices at Napa and Sonoma hotels? Stay in Vacaville at half the price and visit Napa, Sonoma or the nearby Suisun Valley Rustic Wine Country on a daytrip. 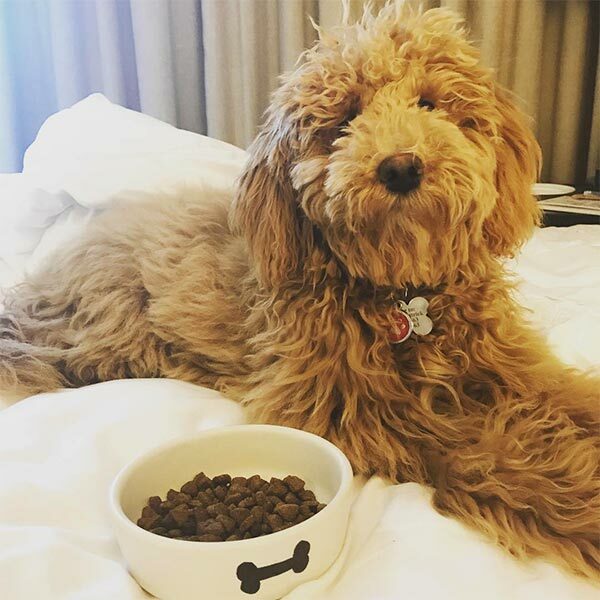 At DogTrekker.com, we list nine dog-friendly lodging options, including the Hampton Inn & Suites Vacaville/Napa Valley, which doesn’t charge extra for pets, includes a hot breakfast in the rates and offers a “puppy love” package, as well. 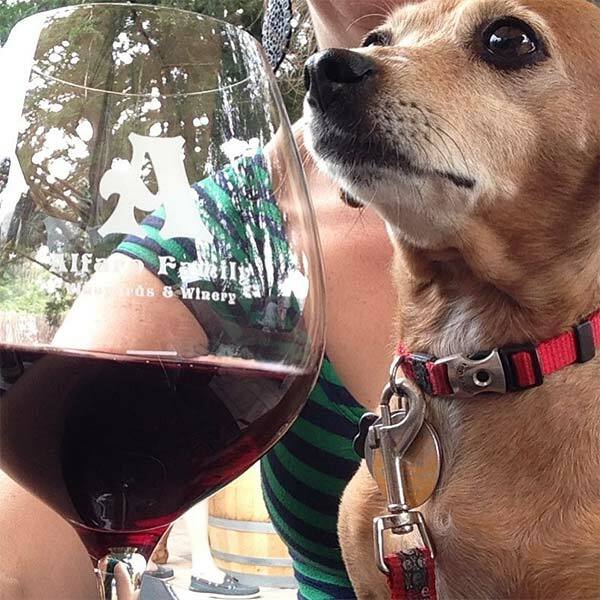 OK, nobody can visit four dozen dog-friendly wineries on one trip! Nevertheless, that’s how many await along the Highway 128 and Highway 101 corridors. Pick a region and let serendipity be your guide as you spend a leisurely day wine-tasting with your pup. Clear Lake, that big puddle of blue in the middle of Lake County, is a popular vacation destination for families, but it’s hardly the only body of water in the vicinity. Blue Lakes (Upper and Lower), just five miles away, are a pair of clear, spring-fed bodies of water ideal for swimming and fishing. Only human-powered craft or those with or electric motors are allowed (speed limit is 5 mph), but you can rent an electric “yacht” or pontoon boat from the Lodge at Blue Lakes and pile the family (dogs included) on board for a great day of cruising about. 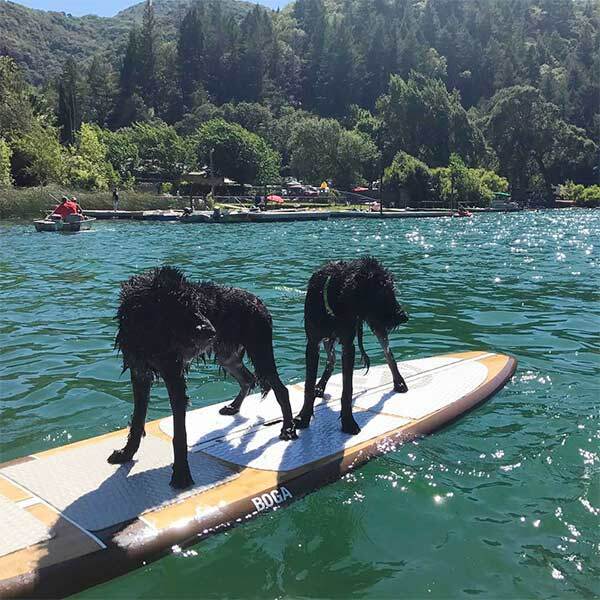 While water activities are of course a big attraction in Lake County, more than 30 wineries, most with dog-friendly picnic areas and tasting rooms, welcome visitors in what is one of the fastest growing wine regions in the country. While the region is best known for its sauvignon blancs, petit sirahs and big reds are gaining well deserved cachet. The Lake County wine-growing region blanketing the eastern portion of the county is divided into seven AVAs (American Viticultural Areas), or appellations, each with its own sense of place. Napa Valley isn’t all about food and wine; it’s also a magnet for artists and art lovers from around the world. 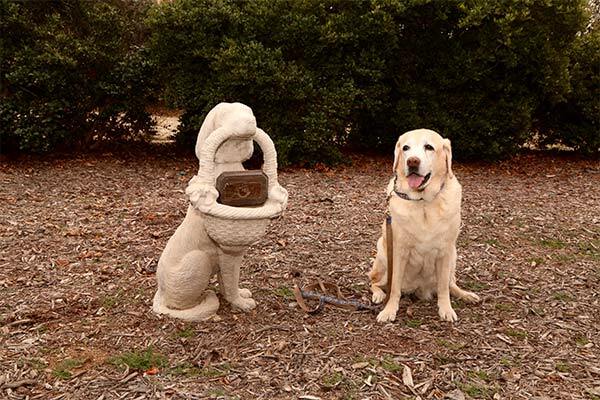 Combining a dog walk with a little art appreciation is a great way to spend a day—and get some unique backdrops for your photos while you’re at it. Start with the 2017-2019 Napa Art Walk, called “Shifting Perspectives,” featuring 10 sculptures by artists from four Western states installed in downtown locations. 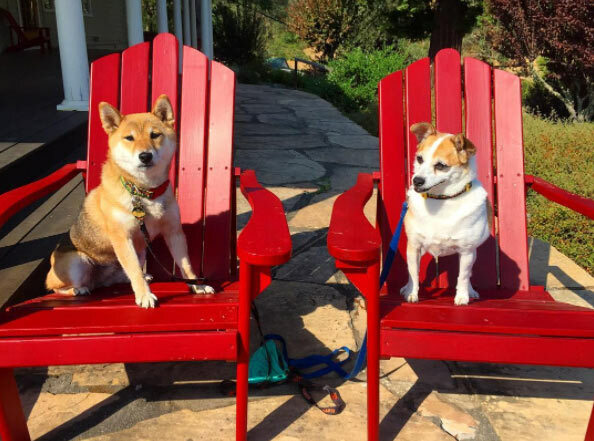 When it comes to dog-friendly lodging in Napa Valley, there are almost as many choices as there are wineries to visit. 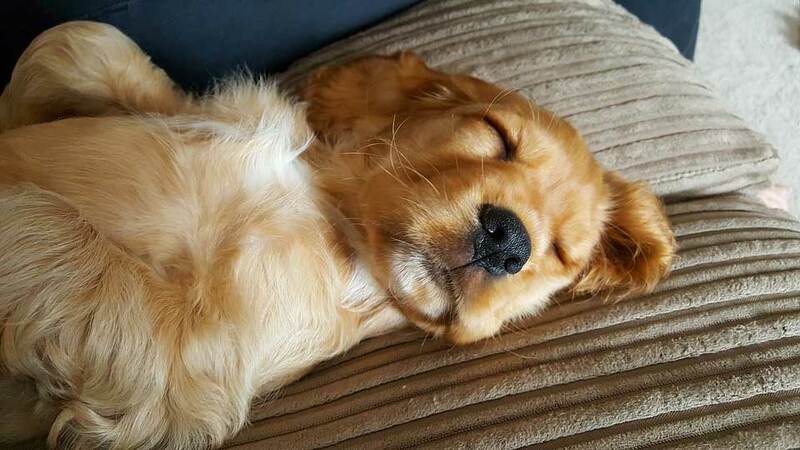 Start your search by sorting out your parameters regarding type, location, level of luxury, price, etc., then delve into the dog-friendly listings on DogTrekker.com. Lodging choices in Napa Valley run from extravagant, five-star resorts to budget motels, but for that certain brand of DogTrekker who prefers to rough it a bit, there’s another alternative: camping. Whether sleeping in a tent, an RV or a rustic shelter, you’ll enjoy the valley from a unique perspective—and have money left over for a splurge. Here are three places to check out. Potential visitors to Napa Valley tend to think first of vine-covered hills dotted with wineries, wineries and more wineries. They’re all here, of course. But it would be a shame to bypass the city of Napa itself. A renaissance over the past two decades has transformed what once was the utilitarian center of wine country into a visitor destination packed with pizzazz. 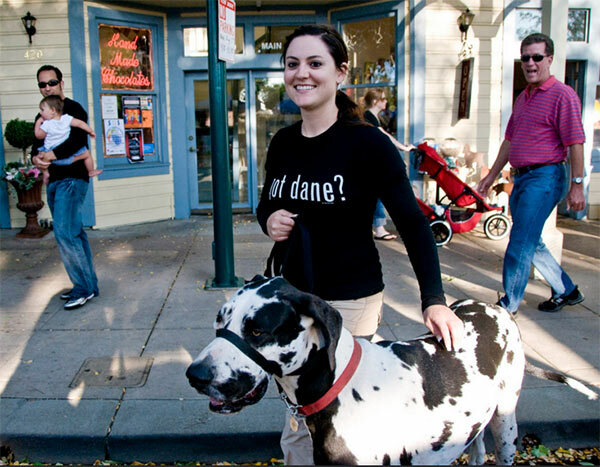 Downtown Napa is walkable, dog-friendly and filled with surprises for two- and four-legged visitors alike. After a rough fire season that took out homes, businesses and lives, Mendocino County is bouncing back with a full helping of winter events and holiday cheer. The gorgeous seashore offers uncrowded respite in winter, while towering redwoods invite contemplation and dog-friendly wineries welcome visitors with treats for the pups and tastes for their people. While parts of Sonoma County were ravished by the October wildfires, residents are banding together to stand strong and welcome visitors to the vast majority of the county that was untouched by the blazes. 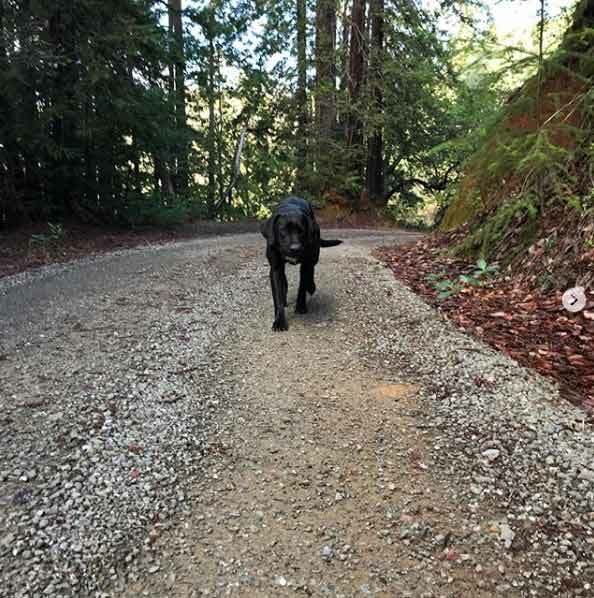 Whether you come to spend a winter weekend in Santa Rosa or explore the Wine Road Northern Sonoma County, you and your four-legged travel companion will find a warm welcome almost everywhere you go. But before your dog can settle down in a tasting room or hotel, she likely needs some exercise. 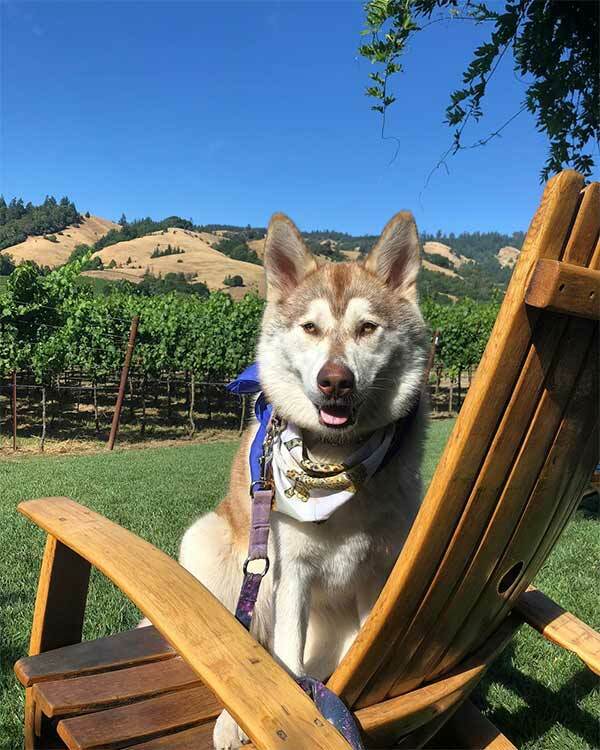 Napa Valley is amazingly dog-friendly, with scores of wineries and restaurants welcoming four-legged visitors accompanied by humans. When it comes to hiking, head to Moore Creek Park, on the north side of Lake Hennessy near St. Helena. Among 15 miles of trails here is the serene, 5.6-mile Shoreline Trail/Alta Hennessey Loop, which traces the perimeter of this fresh-water reservoir with a jaunt into the hills along a dirt road. 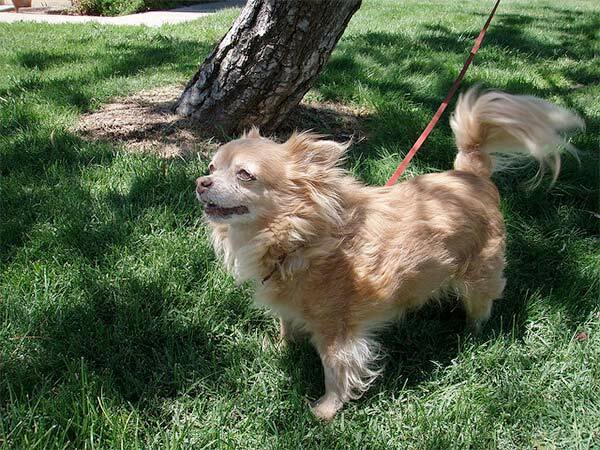 California’s desert regions are at their most compelling in winter, when cool weather and clear skies combine to energize people and pets alike. If you’re planning a trip, don’t think only of cactus and rock. Southern California’s high-desert wine country invites visitors with vines, wines and a swaggering touch of the Old West. It’s all centered around the town of Temecula, 60 miles north of San Diego, 80 miles east of Greater Palm Springs and 90 miles southeast of Los Angeles. If you don’t live in Santa Cruz County, you probably know this gorgeous stretch of the California coast for its beaches, its stellar university and the namesake town that proudly embraces its somewhat eccentric reputation. 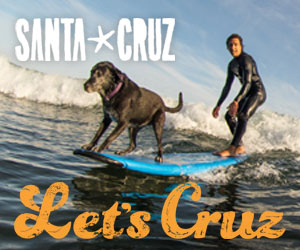 But Santa Cruz County is also known for its mountains, its redwood forests and its wines, particularly the pinot noir and chardonnay that thrive in the fog-kissed climate. 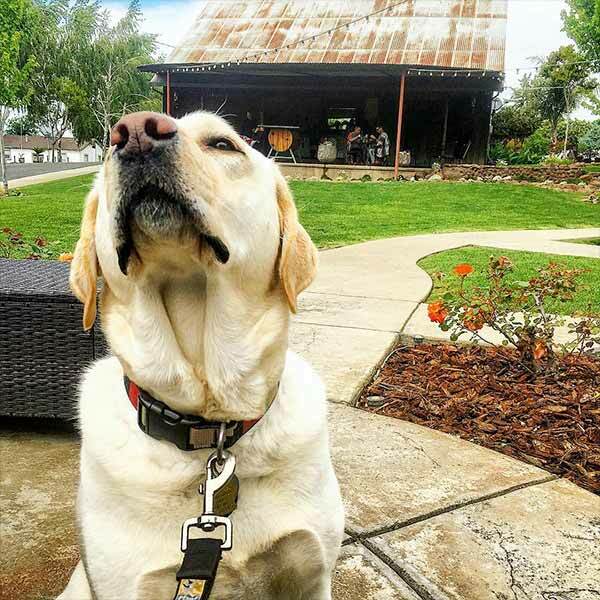 Wineries and tasting rooms are sprinkled throughout the county, and dogs get a warm welcome at many of them. The Lake County wine-growing region blanketing the eastern portion of the county is further divided into seven AVAs (American Viticultural Areas), or appellations, each with its own sense of place. While best known for its sauvignon blancs, petite sirahs and big reds like tempranillo and cabernet sauvignon are gaining well deserved cachet. Wine grapes were introduced to the Sierra Nevada foothills during the Gold Rush years, when miners were thirsty for refreshment and farmers eager to provide. Today, the Sierra Foothills AVA (American Viticultural Area) stretches from Yuba County in the north to Mariposa County in the south, with five smaller AVAs under the umbrella designation. Two of them, El Dorado and Fair Play, are in El Dorado County, within easy striking distance of Sacramento, gateway to the Gold Country wine country. The Tri-Valley region, an hour east of San Francisco, is nothing if not full of surprises, especially when it comes to wine. Production is centered in the rolling Livermore Valley AVA (American Viticultural Area), where the first grapes were planted in the 1840s. 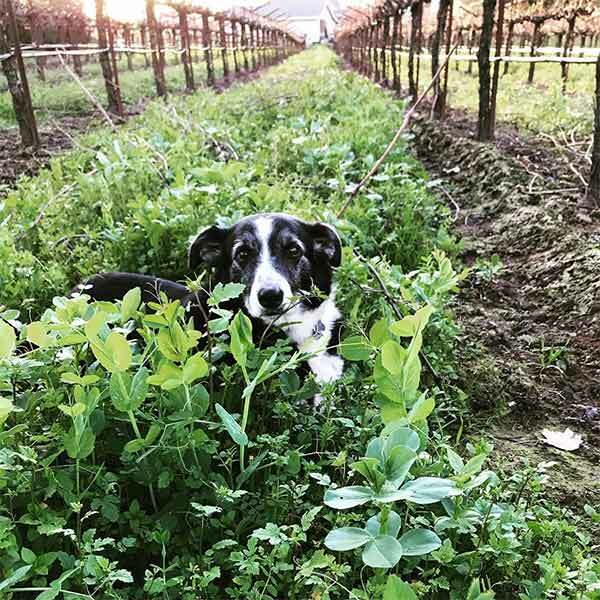 More than 50 wineries, two dozen of them proudly dog-friendly, have since sprung from the rich soil, and they’re all close enough for a day trip or overnight trip from the Bay Area or Sacramento. So leash up your pup, crack a window and take off into the so-close-but-so-far-away countryside. Winery rich Mendocino County is home to 10 American Viticultural Areas (AVAs), a half-dozen of which are smaller regions lumped together under the over-arching Mendocino County label. 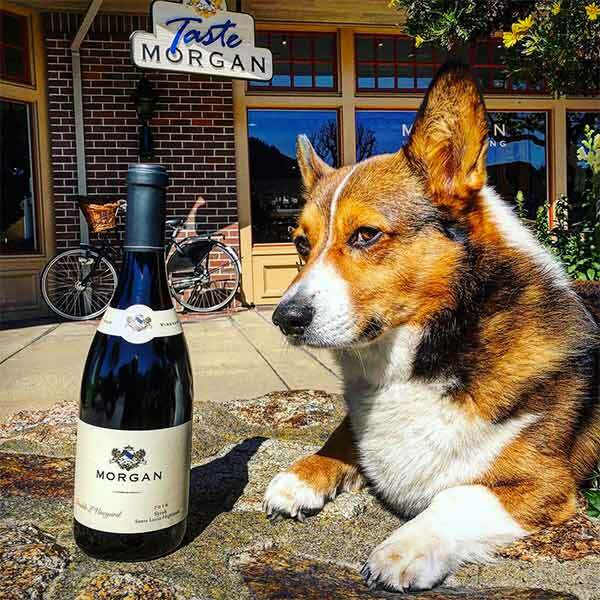 While there are many dog-friendly tasting rooms scattered about, it makes sense for newbies to follow one of two designated “wine roads,” one tracing Highway 128 through the famed Anderson Valley, the other centered around the Hopland area on Highway 101. What part of the Napa and Sonoma valleys is closest to the Bay Area and Sacramento? The answer: Carneros, a wine-growing region and AVA (American Viticultural Area) that spans parts of Sonoma and Napa counties and backs up to San Pablo Bay. The marine influence makes Carneros (which means “sheep” in Spanish) a bit cooler than regions up-valley, with a microclimate ideal for cultivation of grapes used in sparkling wine production. Dog-friendly tasting rooms abound, and while we haven’t visited them all, we have some favorites. While the Tri-Valley region is within easy commuting distance of the Bay Area and Sacramento, after a day of hiking or touring the wine or craft beer trails, it’s always nice to stay for dinner, pull into a nearby hotel and spend the night. Tri-Valley has accommodations to fit any taste or budget and by our count, over two-dozen are dog-friendly. The Hyatt House in Pleasanton even has their own resident dog who hangs out in reception. 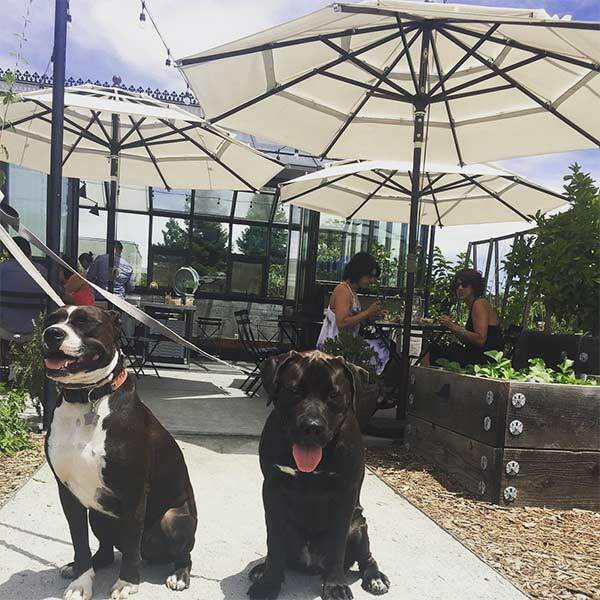 There’s no shortage of places in Tri-Valley to chow down at an outdoor table with your pup at your side. Enjoy the small town hospitality and laid-back vibe whether your choice is award-winning California cuisine, local farm-to-fork comfort food, rustic bistro classics or pubs featuring craft brews. 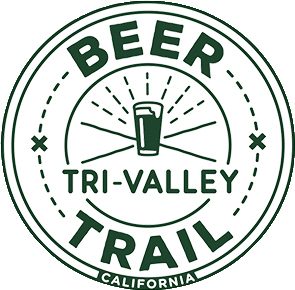 Speaking of craft brews, nine out of the 14 dog-friendly breweries, tap rooms and restaurants on the Tri-Valley Craft Beer Trail serve food. Many are conveniently situated just off Interstates 680 and 580, in or near the cities of Pleasanton, Dublin and Danville. 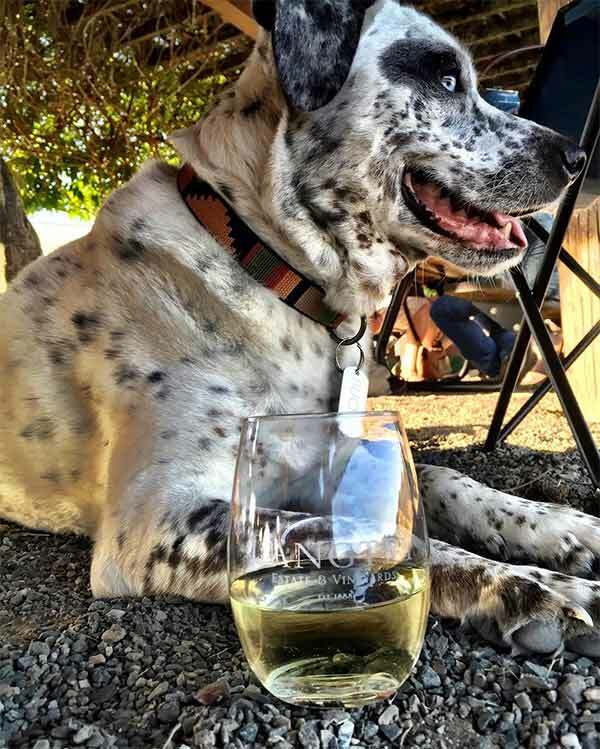 A laid-back atmosphere and dog-friendly vibe prevail at many Tri-Valley wineries where you can both make yourselves at home. Most establishments are located in the picturesque Livermore Valley, one of the country’s oldest winemaking regions. 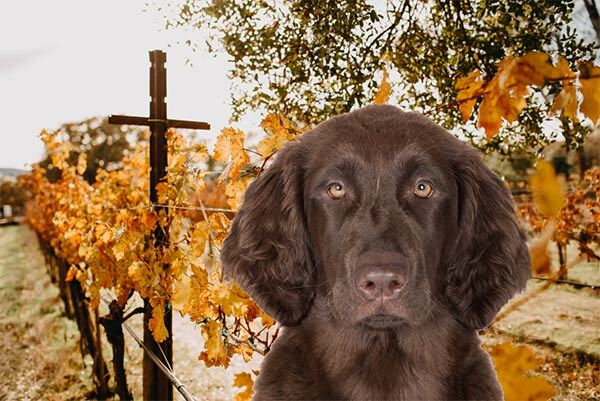 Wine-grape cultivation started here in the 1840s, and today, more than 50 wineries, 23 of them proudly dog-friendly, share an AVA whose terroir is characterized by warm days, cool nights and gravel-based soils. 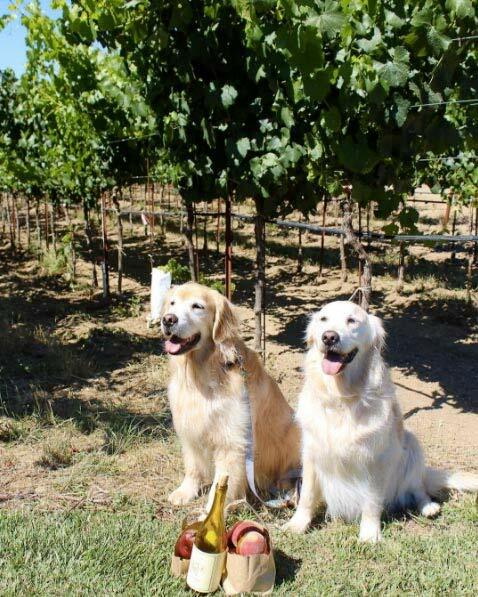 You can check out DogTrekker’s dog-friendly Tri-Valley wine trail before heading out. Three valleys and four cities make up the Tri-Valley region, which away from urban areas is characterized by rolling hills studded with gnarly oaks and sprawling vineyards. It’s less than an hour from San Francisco or Sacramento, straddling the line between Alameda and Contra Costa counties on the “sunny side” of the bay. Dog-friendly hotels, restaurants, wineries and craft breweries abound as you explore the three valleys—Livermore, Amador and San Ramon—from which the region takes its name. 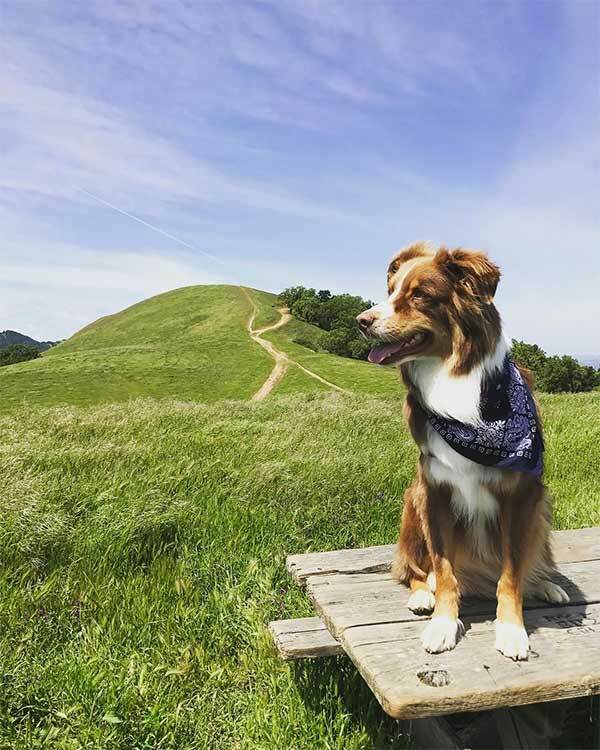 If you plan to put on your hiking shoes and head out to enjoy the East Bay Regional Parks mentioned in this issue, we have just the place to refresh, relax and renew after the hike – the Tri-Valley region of California! Just a little over 30 miles from San Francisco on the sunny side of the bay, this area encompasses three valleys and four cities where dog-friendly hotels, restaurants, wineries and craft breweries and tap rooms abound. Last fall’s fires, combined with harsh winter storms, were not kind to the popular state parks along Highway 1 in the Big Sur region. Much of this scenic slice of coastline remains inaccessible due to unstable hillsides and destruction of the Pfeiffer Canyon Bridge (about half a mile south of Big Sur Station), which has been demolished and is being rebuilt. It won’t reopen until fall at the earliest, meaning camping opportunities this summer are heavily curtailed. Mendocino County’s 47 wineries produce many reds, of course, but crisp viogniers and other whites are also specialties of the region. If visiting in winter, when inclement weather is a possibility, you might want to do a little homework in advance to select establishments that welcome dogs in their tasting rooms as well as in their outdoor picnic areas. 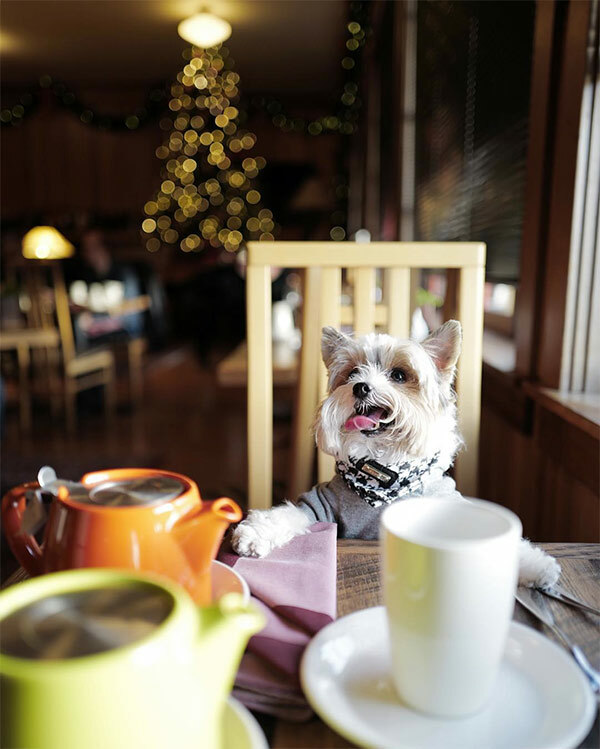 While most Mendocino County restaurants with outdoor dining venues allow dogs to curl up under the table with their owners, winter weather can throw that option a curve ball. In inclement weather when patios aren’t open, your pup can always wait in the car while you dine. Or—if you know in advance—you can take an unconventional route to an indoor venue. Ready for some wine tasting? 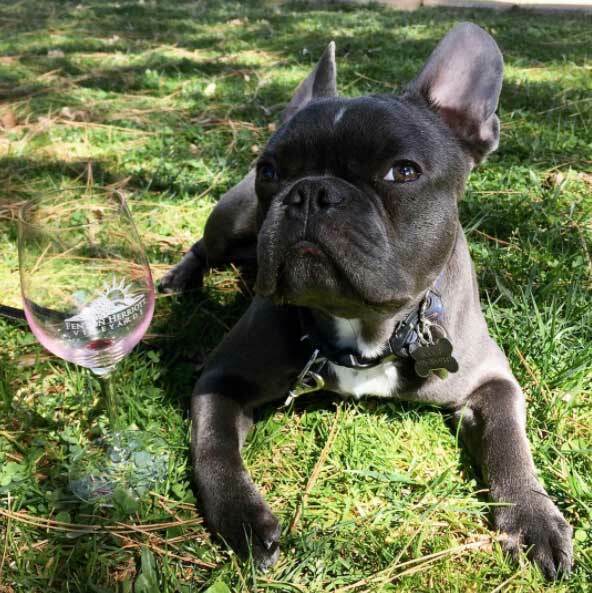 The verdant Suisun Valley, about 20 minutes from downtown Vacaville, is home to numerous wineries that welcome canine guests in their picnic areas. Northern California’s Tri-Valley once supplied hops—a primary ingredient in beer—to brewers around the world. Those roots are reflected in an emerging craft-beer scene drawing visitors and their four-legged companions. Located just 45 minutes east of the Golden Gate Bridge, the region is made up of the charming towns of Pleasanton, Livermore, Dublin and Danville. 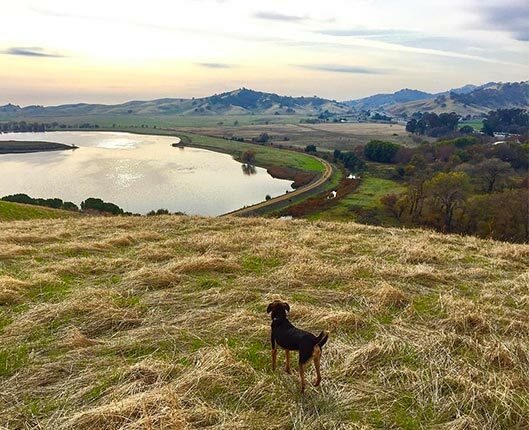 For those who live in San Francisco, Sacramento and most points in between, the Tri-Valley region, with its rolling topography and semi-rural character, offers a refreshing change of venue for weekend explorers traveling with their dogs.